The need to understand and address large-scale environmental problems that are difficult to study in controlled environments—issues ranging from climate change to overfishing to invasive species—is driving the field of ecology in new and important directions. Observation and Ecology documents that transformation, exploring how scientists and researchers are expanding their methodological toolbox to incorporate an array of new and reexamined observational approaches—from traditional ecological knowledge to animal-borne sensors to genomic and remote-sensing technologies—to track, study, and understand current environmental problems and their implications. The authors paint a clear picture of what observational approaches to ecology are and where they fit in the context of ecological science. They consider the full range of observational abilities we have available to us and explore the challenges and practical difficulties of using a primarily observational approach to achieve scientific understanding. They also show how observations can be a bridge from ecological science to education, environmental policy, and resource management. Observations in ecology can play a key role in understanding our changing planet and the consequences of human activities on ecological processes. This book will serve as an important resource for future scientists and conservation leaders who are seeking a more holistic and applicable approach to ecological science. "...[F]ull of enthusiasm and passion for the power of observations to explain, inform, and educate....They take on a number of sacred cows, and gore them, so this will be a thought-provoking and much-discussed book." "There is much in this volume that field-oriented conservationists will be heartened by, but just as much that will stimulate serious self-inquiry about the practice of science in the field." "Rafe Sagarin and Anibal Paichard have written an engaging manifesto for a renaissance of field research in ecology ... inspiring reading"
"This review scratches the surface of (and heartily endorses) the case the authors make for observation to become prominent again in ecology." "Sagarin (Univ. of Arizona) and Pauchard (Univ. of Concepcion, Chile) view the history of ecology as moving from observational science during the later 1800s to experimental and theoretial science during the 1900s to revived observations during the 2000s but without replacing experiments and theory. Their book is a guide for this new ecology, defending it against detractors and explaining with sophistication how to proceed." "Observational ecology demonstrates how and why direct sensory awareness of the natural world is a bridge to deeper ecological understanding. This is a groundbreaking work for teachers, scientists, policymakers, and citizens. It empowers the reader to blend disciplined observation with rigorous science. It explains why hands-on field immersion is the key to understanding and internalizing global environmental change. This is a brilliant handbook and rationale for anyone who wants to make ecological learning accessible." "An inspiring, thought-provoking, critically needed treatment of how to use our power of observation to expand ecological knowledge and contribute practical environmental solutions. Observation and Ecology presents and develops a bold holistic approach to ecological research, realized through our human ability to integrate diverse signals and patterns. A must read for current and future ecologists." 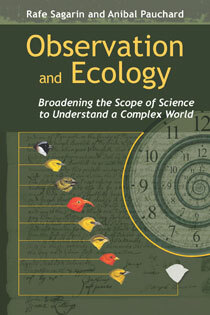 "Observation and Ecology is a timely, superbly written, and highly innovative manifesto on the importance of clever observations for solving fundamental problems in ecology and environmental management. I thoroughly enjoyed reading the book and recommend it to anyone interested in understanding the complex workings of ecosystems in our human-dominated world." "This book succinctly, and with great enthusiasm, makes the case for observational research in ecology ... If you are already a multidisciplinary or observation-based ecologist, this book will legitimize your work. If not, it should give you some reasons to expand your outlook and encourage you to accept observation-based research as 'real' science." "This book should motivate restoration ecologists..."
Chapter 7. Is Observation-Based Ecology Scientific?